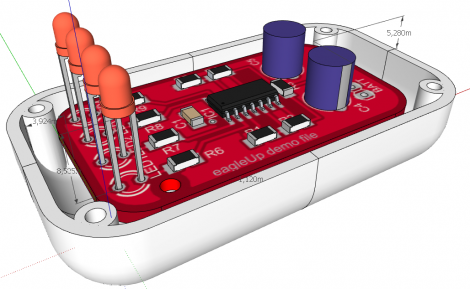 [Karl] wrote in to tell us about a software package called EagleUp that will import your Eagle CAD PCB designs into Google SketchUp. It bridges the gap between the two using the open source image processing software ImageMagick. As you can see above, you’ll end up with a beautifully rendered 3D model of your hardware. This is a wonderful way to make sure that your enclosure designs are going to work without needing to wait for the PCBs to arrive from the fab house. It is available for Windows, OSX and Linux (although the last time we tried to run Sketchup under Wine nothing good came of it — perhaps it’s time to try again). In [Karl’s] case, he’s working on an Arduino compatible board based around the Xmega. He mentions that EagleUp is a great way to get an idea of how component placement will end up, and to see if the silk screen layer is going to turn out well or not. Here’s a link to one of his test designs. Awesome, thanks for pointing out! Does that make ArtRage a Nefarious Task ? Just click on the damn software. This is awesome. It’d be nice if I could export to Pro/E or SolidWorks, since that’s what I use for enclosure design (I can send out the required files for milling, molding, etc. very quickly and easily). But hey, we’re all looking for solutions, the regular version of SketchUp is free, and so is the non-profit version of EAGLE. I think we have a winner. :) Thanks for the linkage, Mike. I think you can export to STL and then import into Solidworks. An STL file contains just triangle information. no eagle3d and povray ? If you are just looking for pretty pictures of your PCB i have to plug Eagle3D. It uses poray to render, but it can still be helpfull to spot hard to reach buttons, or bad connectors. KiCAD has had a 3D viewer for the longest time. Daid: You still won’t be able to call up the task manager when you try to save, and try to resize a bookmark-window of ‘specs’ in KiCad … and that’s the problem. Daid: You still won’t be able to call up the task manager when you try to save, and try to resize a bookmark-window of ‘specs’ in href=”http://kicad.sourceforge.net/wiki/Main_Page target=”KiCad”>… and that’s the problem. Daid: You still won’t be able to call up the task manager when you try to save, and try to resize a bookmark-window of ‘specs’ in and that’s the problem. Ok. I looked at your review. The problem is that you are *already familiar* with Eagle. You have forgotten how long it took you to figure out how to do things in Eagle. Now you can do things quickly in Eagle (because you know the shortcuts) you expect to be able to do things instantly in KiCAD. Using Eagle for free is great! But, the first time you hit their (artificial) limitations (board size or whatever) you have to pay. Why risk it? It took you 15 minutes to add a component? Did you look at the help? Did you check any of the extremely helpful websites? Or did you just randomly click on buttons to see what happened? 2) There is a button to annotate the schematic automatically. The thing is, KiCAD will always get better, and it will always be free. I’m glad there is a choice for PCB design, but I have chosen KiCAD because it is free of charge and free of restriction. The end result (a PCB) is the same. I have installed and run sketchup in WINE recently and it works EXTREMELY well now. So go for it HAD! Daid: You still won’t be able to call up the task manager when you try to save, and try to resize a bookmark-window of ‘specs’. Looks great! I gave it a try, creating the model for a pcb, but unfortunately only 2 components had 3d models. So there is a lot to work at creating the parts and then it should be superior to the previous eagle 3d rendering. I can’t wait for the model database to grow so i can use it including the case and everything. I wouldn’t say superior, EagleUp and Eagle3D have two very different styles. EagleUp has a more comicy style, which works really well for explanation and documentation. Eagle3D has a more realistic result which is better suited for presentations and PR / marketing. I like both styles, but i have always ben to lazy to add new components to EagleUp. True sparkfun did it first and you can do this in POVray. But….this …is …SOOOOOO…much easier. ULP to export, import into sketch up. no faffing around! There seems to be a sentiment about this tool being redundant, with Eagle3D already out there. However, POVray is not an intermediate file format; it’s meant for POVray and POVray alone; there aren’t any tools for data exchange; no fully featured translators to convert to other formats, and no other software than POVray uses the file. Note that some software do import POVray format, but only the mesh data; Eagle3D produces CSG data which won’t be loaded. Even Moray, explicitly a POV-ray tool, cannot load them. Thus you cannot use the files produced by Eagle3d for any kind of engineering work, eg. case design or clearance verification, nor you can use them in any graphics package other than POVray. Being able to create a photorealistic image of the board does have it’s uses, but the practical use of E3d is very, very limited. As for the cartoony look of Sketchup, that’s a matter of choice. Since Sketchup actually plays ball with other software, you can use whatever renderer you choose. Even POVray.